People says “If you feel comfortable in your own shoes, you have done a well job.”, but would you feel comfortable in your shoes if your feet hurt? After paying so much attention on our face, hands, hair and body, it is time to take care of our feet. Usually feet can be dry and rough and heels can be cracked. That not only look bad, that causes pain as well. The problem of cracked feet can affect anyone, especially people who have eczema, diabetes or the elderly. Your feet take the weight of your whole body so it is properly to take good care of them. We can give you few ideas about how to treat your feel using products that you all have at home and tips how to protect feet from cracking. You won’t believe how easy it is and how little time you need for perfect feet. Every day care for your feet is really easy and you don’t need special products. All you need is 10 minutes to relax, you can read a book or talk on your cellphone during this treatment. Before that, full a bucket with worm water and put a little salt in. Soak your feel 10 minutes and then scrub off the dead skin with pumice stone. After, wash your feet with clean water and dry them well. In the end put moisturizing lotion on your feet and put on socks for better locking in the moisture. Repeating this twice a week will be perfect and you will see great results after one month. It is very important to keep your feet skin hydrated because feet dryness is the main reason for skin cracking. Oil massage is a good way to keep your feet skin moisturized. 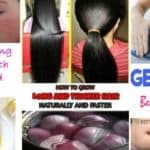 Using natural oils like almond oil. vitamin E oil or olive oil. Firstly, warm up the oil in a microwave. Then liberally rub the oil on your foot and start a gentle massage so the oil penetrates deep into the skin. Massage your feet after you wash them and dry them well and repeat this massage every day for baby soft feet skin. 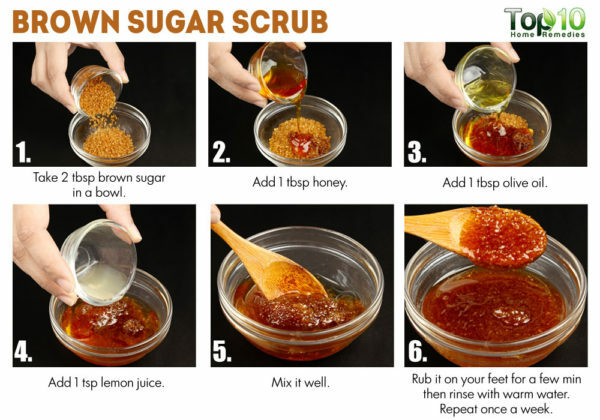 Easily scrub away the dead skin off your feet with the help of the small granules of the brown sugar. Extra benefit from brown sugar is that it contains glycolic acid that fight against bacterial infections. Preparation is very easy, mix 2 tablespoons of brown sugar, 1 tablespoon of honey, 1 tablespoon of olive oil and ½ tablespoon of lemon juice. Apply the paste on your feet and rub it around in circular motions until the sugar melt away. In the end wash your feet with warm water. Repeat this treatment once a week. 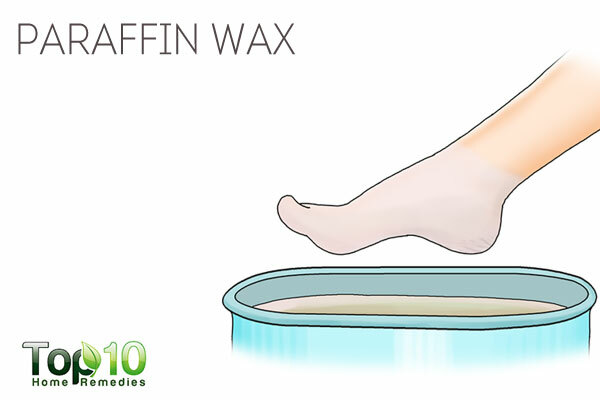 Melt one block of paraffin wax in a boiler and mix 2 tablespoons of coconut oil in the wax. Wait until mixture cool enough and thin layer forms on the top. Dip your feet in the mixture, wait 5 to 10 seconds and dip them again. After repeating this 5 times, cover you feet with plastic wrap and wait 30 minutes. After removing the plastic, peel the wax off your skin. Repeat this twice a week and you will have amazing results. Apply the pulp of a rip banana on the cracked parts of your feet and keep it on about 10 minutes. 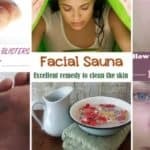 After, just wash out feet with warm water and enjoy smooth and soft skin by repeating this 3 to 4 times a week. 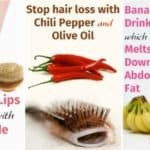 The other use of banana would be mixing it with avocado, coconut oil and honey. 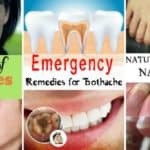 Apply this mixture on your feet and wash them with warm water after 10 minutes. 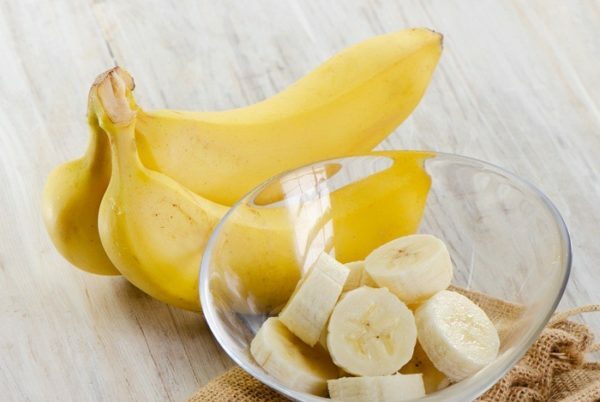 Repeat this once a week and you will see the benefits of the banana.